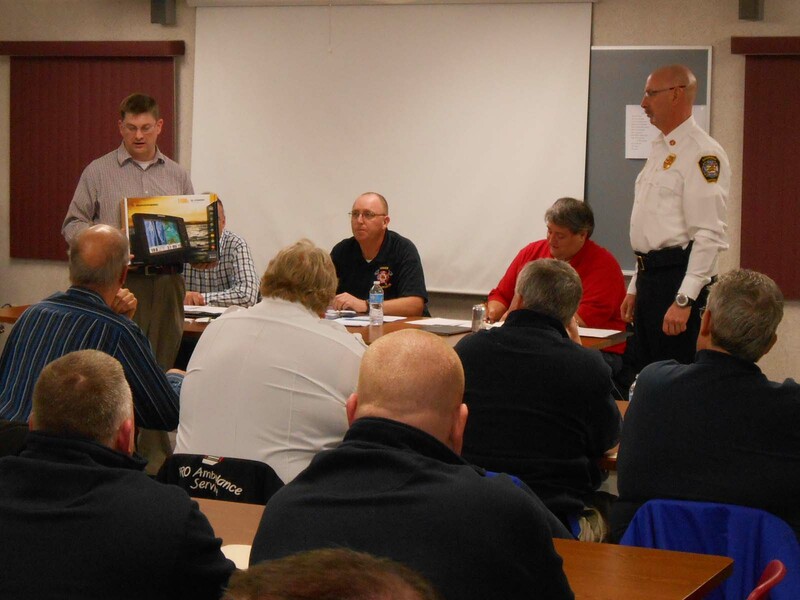 Champaign County EMA was successful in obtaining donations from The Atkins Group, the Champaign County Fire Chief’s Association and the county MABAS((Mutual Aid Box Alarm System) 28 Fire Service group to purchase a sonar system for the County Dive Team. This sonar system will provide the Dive Team with the capability to search in deep water for persons, vehicles, and items and record findings for evidence. 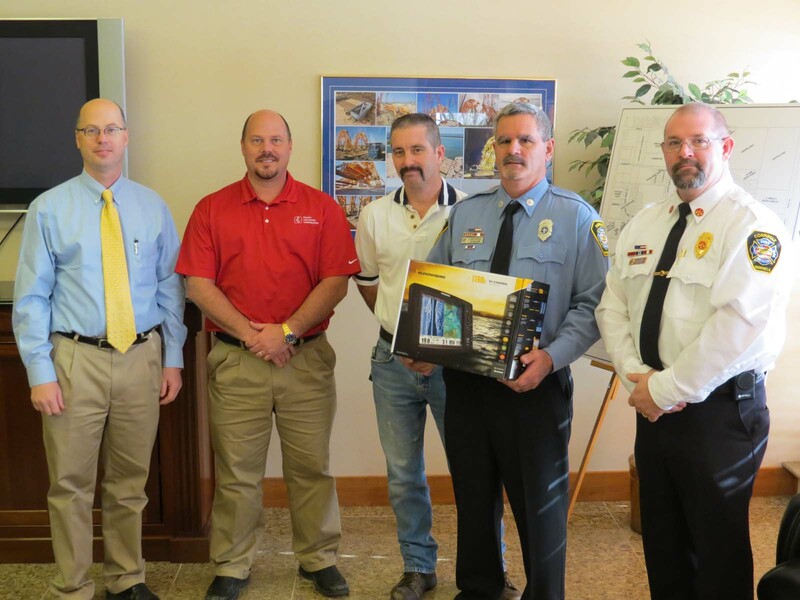 On January 31, 2013, The Atkins Group formally presented the system to Lloyd Galey, Chief of the Cornbelt Fire Protection District and the County Dive Team. A subsequent presentation was held at the Champaign County Fire Chief’s Association on February 14th in Homer. Officials from the National Weather Service (NWS) Central Illinois Forecast Office in Lincoln declared Champaign County a Storm Ready® County during a presentation at the Tuesday December 11th County Board meeting. This award has only been given to 18 other counties in Illinois. The award is in recognition of the County EMA and local agencies active planning, training and preparedness for weather related emergencies. The award was presented by Chris Miller, Warning Coordination Meteorologist for the National Weather Service, Lincoln, and accepted by Champaign County Board Chair Alan Kurtz, Champaign County EMA Director, John Carlson, Champaign County EMA Deputy Director, John Dwyer, and Champaign County EMA Public Information Officer Rick Atterberry. StormReady® is a registered trademark used by NOAA. With holiday shopping in full swing, you might want to consider presents and stocking stuffers that could save lives during emergencies. Gifts such as NOAA Weather Alert radios, flashlights and first-aid kits can help friends and family prepare for disasters, while smoke alarms, carbon monoxide detectors and fire extinguishers will make their homes safer. A vehicle preparedness kit is easy to assemble. A backpack or rubber tub can be stocked with items such as a flashlight, extra batteries, blankets, jumper cables, first aid kit, windshield scraper, small shovel, water bottles and some non-perishable snack foods. Fire safety and prevention gift ideas, such as foldable ladders for second-story emergency escapes and flameless scented candles, are also great gift ideas. 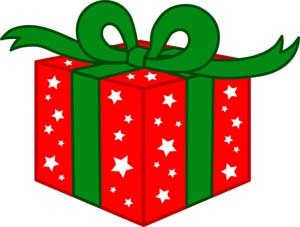 Most preparedness and safety gift items can be found in hardware and department stores. For additional information on emergency preparedness, visit the Ready Illinois website at www.Ready.Illinois.gov. The OSFM website, www.sfm.illinois.gov, offers more information about fire safety. Forty volunteers completed a 16-hour Ground Search and Rescue training course on the weekend of October 20-21, 2012. Training began at the ILEAS (Illinois Law Enforcement Alarm System) classroom facility in Urbana and then moved to Homer Lake in SE Champaign County. The training was conducted by Illinois Search and Rescue Council certified instructors, from the McLean County EMA Search and Rescue Team and the Peoria County Sheriff’s Office / Search and Rescue Team. The training included an overview of SAR fundamentals, lost person behavior, SAR operations in the field, and search crew field operations both during daylight and at night. Champaign County EMA, the Champaign County Sheriff’s Office, the Cornbelt Fire Protection District Dive Team, and the Homer Fire Dept. assisted in the training.